Drain Cleaning isn’t fun, but no one likes having a clogged drain. They come unexpectedly and are usually time-consuming to fix, worse if the problem is particularly bad. And while you may already have a drain emergency, it’s always nice to know how to manage your household drains the future. There’s a few things to avoid when it comes to preventative maintenance if you live in Seattle. Don’t dump chemicals down the drain, even that of the shower of utility sink. This includes paint and paint thinner. Never poor grease down your drain. It can make even the toughest drain cleaning job more difficult! Clean all your sink stoppers regularly, and poor boiling water down the drain. Maintaining your sewer is equally important. 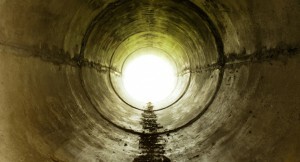 While not only much more difficult to repair then most drains, it can also be much more costly. Taking precautions, such as having sewer cleaning done, can save a huge headache down the road and even a possible sewer replacement or repair. If you need high-quality, professional drain or sewer cleaning, contact us today or request a free quote. Until a couple of decades ago, if an underground drain malfunctioned, there was no solution other than digging it out and replacing it, irrespective of the scale of the problem. Plumbers would recommend pipe replacement – whether the pipe was whole but choked, or it had collapsed completely – incurring huge costs and causing significant disruption. However, technology has made its mark in plumbing, and there are now hi-tech ways to clean, repair and replace pipes with minimal expense and disruption to property and residents’ routines. In the plumbing industry, high-tech solutions like trenchless drain repair and cleaning call for expert technicians. At Bob Oates Plumbing, Sewer and Rooter, we have a team of highly skilled, experienced technicians that answer your call for services with a friendly attitude and modern equipment. No matter what time a client’s call comes, our team members will reach the affected premises and first carry out a drain inspection to know the exact nature and location of the problem. Once that is ascertained, the team moves to clean the drain. This is an essential step for drain cleaning and trenchless repairs. Our team comes in vans equipped with all the machinery they could need: mechanical rooters, hydro jetters, pressure pumps and more. They fix the problem quickly and efficiently and make sure they leave the well satisfied. Our team is experienced, professional, and efficient. Bob personally trains background-checked plumbers in latest plumbing techniques and equipment. High quality work, delivered at competitive rates. Guarantee on the work we do and the parts we use. We can resolve domestic and commercial plumbing problems with ease. Clients can request free quotes for services.